Ibrahim Ali Khan, who is the youngest son of Bollywood actor Saif Ali Khan and Amrita Singh has stepped into Bollywood film industry with the movie called "Tashan" in 2007 where he wast cast for the role of Jimmy ( Junior ). This young and handsome teen suddenly came into flash and really setting social media on fire with his Dubsmash video that drew praise from none other than SRK and his heroic posing ways with Khushi Kapoor (Sridevi’s daughter) and Aaliyah Kashyap (Anurag Kashyap’s daughter) has made his father little angry recently. The protective father has now asked his son to exercise caution while using social media tools for posting pictures and videos. 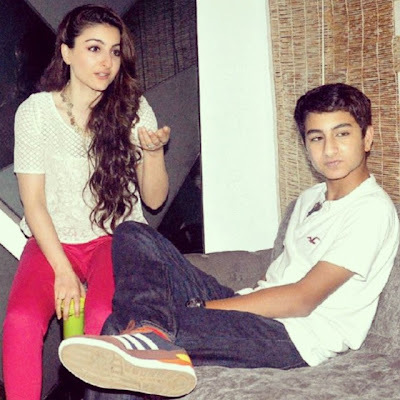 Ibrahim was born on October 2001 to Saif Ali Khan and Amrita Singh and brought up into a royal family of Pataudi Nawabs. His elder sister name is Sara Khan. He is studying in Dhirubhai Ambani School of Mumbai right now which is a famous school for celebrity kids. Apart from studies, he is very avid and active in sports too. Soha and Saba Ali Khan are the names of his two aunts and Bollywood actress Kareena Kapoor who got married to Saif is his second mother.